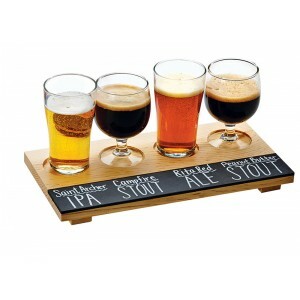 Madera Write-On Taster Board - Cal-Mil Plastic Products Inc.
Micro-breweries are the newest & hottest places to grab a drink. With beer on the rise, tasting boards are a MUST-HAVE item. But don't limit yourself to just beer, these taster flights can also be used to serve whiskeys, bourbons, and other liquors. Whatever the drink-of-choice, the experience is always guaranteed. A major highlight of these boards is that they feature a chalkboard label where names of any kind of beverage can be written with chalk or our write-on pens. Never mix up your drinks ever again! Write On Strip with chalkboard style, use our write-on pens!